Qiddiya Project, Al Ula Project: can Saudi Arabia turn into a tourist destination? The United Arab Emirates is a nation rich in many things. Besides being home to luxury developments and soaring skyscrapers, the GCC state also boasts many incredible theme parks. While there are various parks across the country’s cities and towns, our list features parks in Abu Dhabi and Dubai. From international and branded parks to local themes and waterparks, each of these theme parks has earned a spot as one of the best theme parks in the UAE and beyond. Whether you are simply visiting the UAE in a trip or even if you are one of its residents, you will definitely find a theme park to your liking. Here are 6 of the best theme parks in the UAE. 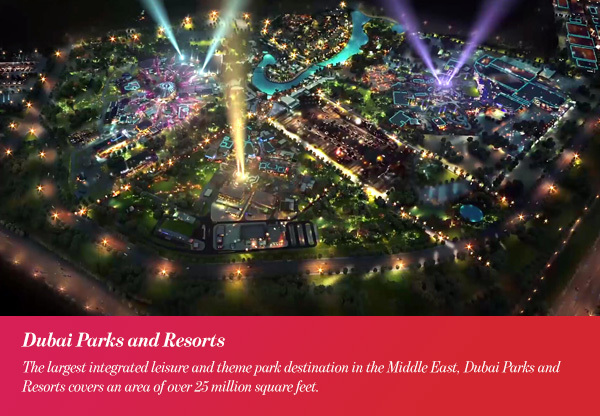 The largest integrated leisure and theme park destination in the Middle East, Dubai Parks and Resorts covers an area of over 25 million square feet. Located on Sheikh Zayed Road in Dubai, it includes over 100 rides and attractions. The park consists of three theme parks: Motiongate Dubai, Bollywood Parks Dubai, and Legoland Dubai, and one water park: Legoland Water Park. Furthermore, it features Riverland Dubai, a themed retail and dining destination, and the Polynesian-themed family resort, Lapita Hotel Dubai. In late 2019, Six Flags Dubai will be the fourth theme park addition to Dubai Parks and Resorts. This will add 27 rides and attractions and increase the destination’s area to 30.6 million square feet. At Motiongate Dubai, visit five different zones: Columbia Pictures, Smurfs Village, Dreamworks, Lionsgate, and Studio Central. Rides, attractions, and creative dining venues await at one of the best theme parks in the UAE. The first of its kind in the world, Bollywood Parks Dubai features five zones inspired by the greatest Bollywood blockbusters. Restaurants, cafes, live entertainment, shopping, and musicals make this park a place you don’t want to miss. Legoland Dubai boasts over 40 LEGO-themed rides, shows, building experiences and attractions for families with children. Here, you can tour the FACTORY and learn how bricks are made and visit The BIG Shop, the largest LEGO® store in the Middle East. As for Legoland Waterpark, experience 20 water slides and attractions designed especially for families with kids. At this waterpark, you can also build your own LEGO raft and float down the lazy river. 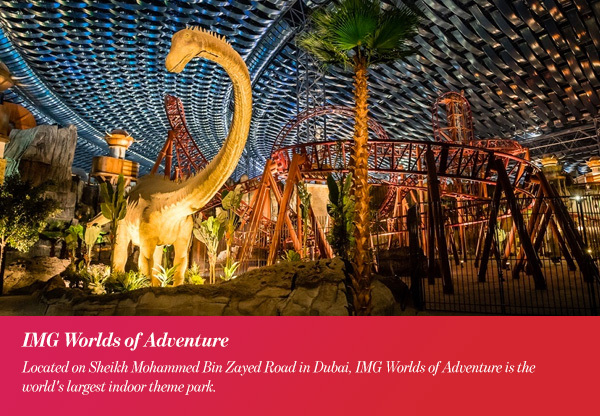 Located on Sheikh Mohammed Bin Zayed Road in Dubai, IMG Worlds of Adventure is the world’s largest indoor theme park. Divided into four zones, the park features global brands such as Cartoon Network and Marvel. It also hosts two original concepts, IMG Boulevard and the Lost Valley – Dinosaur Adventure. Covering an area of 1.5 million square feet, the park can welcome over 20,000 guests a day. Moreover, it includes roller coasters, thrill rides, and other attractions based on popular characters and animatronic dinosaurs. IMG Worlds of Adventure also includes themed retail stores, dining venues, and a 12-screen Novo cinema complex. As one of the best theme parks in the UAE, you will definitely be coming back for more. 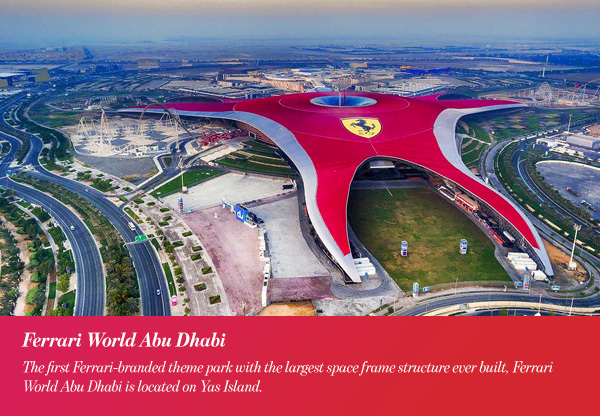 The first Ferrari-branded theme park with the largest space frame structure ever built, Ferrari World Abu Dhabi is located on Yas Island. The park is also home to the fastest roller coaster in the world, Formula Rossa. Chosen as the “Middle East’s Leading Theme Park” at the World Travel Awards in 2017, the park covers an area of 86,000 square meters. Moreover, it was chosen as the “Middle East’s Leading Tourist Attraction” at the World Travel Awards in 2015 and 2016. While the park’s foundation stone was laid in 2007, it opened to the public in 2010. At the park, you can enjoy a variety of rides, attractions, and shows for visitors of all ages. You can also purchase Ferrari fashion and memorabilia as well as dine at any of the park’s five restaurants. 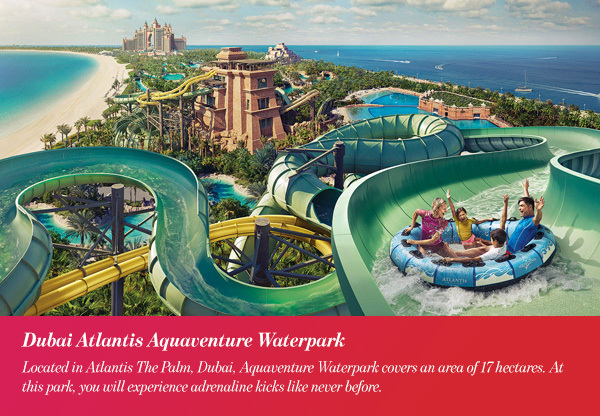 Located in Atlantis The Palm, Dubai, Aquaventure Waterpark covers an area of 17 hectares. At this park, you will experience adrenaline kicks like never before. Home to the world’s largest waterslide, the world’s first dual waterslide within a waterslide, and a 9 story tall mega-slide, you will be traveling at speeds up to 60 kilometers per hour. Dubai Atlantis Aquaventure Waterpark is one of the best theme parks in the Middle East and Europe that promises hours of endless fun. However, that’s not all. At this waterpark, you can explore its rivers on inner tubes, explore a shark lagoon, and feed Cownose Rays. The park also features a private beach for visitors and 16 different restaurants and kiosks. With over 40 rides, slides and attractions, Yas Waterworld Abu Dhabi is located on Yas Island. 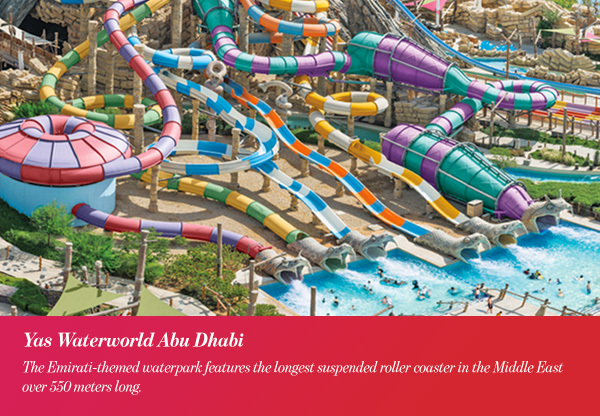 The Emirati-themed waterpark features the longest suspended roller coaster in the Middle East over 550 meters long. Grouped into four categories, the attractions offer different adventures for various age groups. Covering an area of more than 15 hectares, the park carries a theme of a young girl, Dana, who travels on a journey to retrieve a lost pearl in order to restore prosperity to her village. The strong story is reflected throughout the park’s attractions and architecture. Furthermore, as one of the best theme parks in the UAE, the park also includes several shopping and dining destinations. 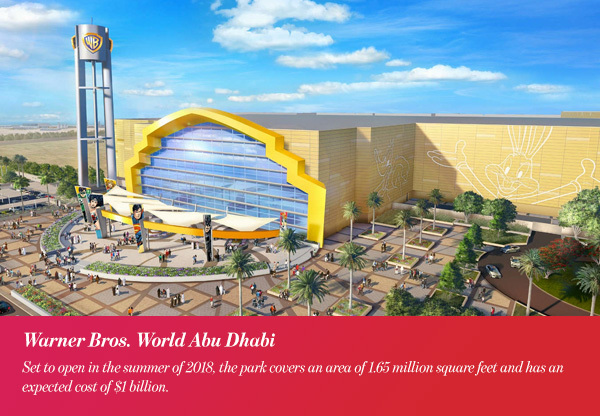 While it has not opened yet, Warner Bros. World Abu Dhabi is set to be one of the best theme parks in the UAE. Set to open in the summer of 2018, the park covers an area of 1.65 million square feet and has an expected cost of $1 billion. Located on Yas Island near Ferrari World and Yas Waterpark, is the third Warner Bros.’s theme park With 29 rides, restaurants, attractions, shops and shows, the park features six immersive lands inspired by Warner Bros. characters. The much-anticipated theme park promises guests a unique experience in each of its lands. Furthermore, Warner Bros. Plaza, the center of Warner Bros. World Abu Dhabi, will feature media shows hosted by Bugs Bunny.